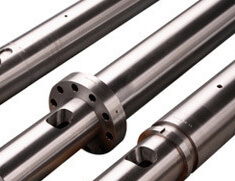 We are able to offer an extensive range of barrels for all machine types, these are available in standard nitride or in bimetallic. There are different grades of bimetallic for abrasion or corrosion, bimetallic will increase the life of your barrel by at least 3/4 times compared with standard nitriding. All repairs will be inspected and re-sleeved (5 times the diameter) in bimetallic. It is also possible to hone out existing barrels and rebuild your screw to suit.